Seeing if anyone is interested in partnering with me on this--I am 85% sure I am going, and sorry for late notice. 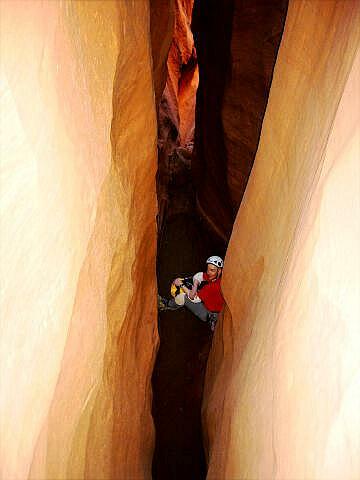 I am planning on meeting a group from Colorado to do several canyons on above dates. They require full canyoneering technical gear--helmets, harness, rap/belay device, biners, etc. Also need knee/elbow pads, old clothes to trash as lots of downclimbing in narrow slot. Wetsuit optional, not much wading. I plan on driving up car camp somewhere near Flag thurs nite, up early and drive in to area near Hanksville Ut on Fri. Trip leader knows I plan on joining the Sat and Sun fun only. So Fri will be mostly driving but some photo ops and maybe a short hike till get to group campsite and meet the folks after their Fri trip. Start back Sun evening, and plan to return on MON!!! So you need Fri and Mon off. Sat canyon has at least a 50 foot rap early and a 150 foot exit rap which is supposed to be spectacular in a winding crack. Please let me know if you are interested, and can ride up with me. You'll need to have car camp gear along with other and I can give you more details and info I have from the trip leader. Augh! I'm going to have to be in Tucson that weekend. Wish I could make it! Well, I probably won't be doing this either. Hand injury from caving this weekend. It was a wild Mutual of Omaha weekend too---saw and caught a 4 foot gopher snake, saw another alligator lizard, a bull elk with a huge rack from about 30 yards, a bunch of supposedly rare owls from mexico, an overflight of some parrots prolly from Mexico, a fawn ( late in the year for him) and picked apples and pears at an old orchard. Got into a cave with some bad air --you try rigging an ascending system while your addled by not enough oxygen. Later I was head first down a hole with Brian holding a rope tied around my feet. Looks like yet another new project. "Sigh"--- I need something nice and easy to do for a month or so. gopher snake caused the hand injury ? Sent out to pickup a rattlesnake, while in the bucket she started laying the egg sacks. Left "mom' and nearly newborns in the nearby desert. Sorry you are missing the trip look forward to the pictures. Leaving thursday for several days, looks like its going to be the Heber area. Letty---hope you heal up quickly. If you're looking for something easy to do come hike with me .